Francesco Podesti (1800 –1895), the skilled painter and portrait artist, was entrusted with the task of realising a work to commemorate the proclamation of the dogma of the Immaculate Conception in the Vatican. The work was to be frescoed onto the walls of the Borgia Tower, in a room that is adjacent to Raphael’s Fire in the Borgia, realised three centuries previously. With great courage and humility, Podesti accepted the commission that Tomaso Minardi (1787 –1871), the Italian painter, had previously declined precisely because of its proposed proximity to Raphael’s great work. The fresco of the Proclamation of the Dogma of the Immaculate Conception occupies an entire wall in the room. The spatial design of the fresco, which is separated into two parts, is the same as that of the Disputa on Religion also by Raphael. Like Raphael’s great work, it shows both the Militant and Triumphant Church. 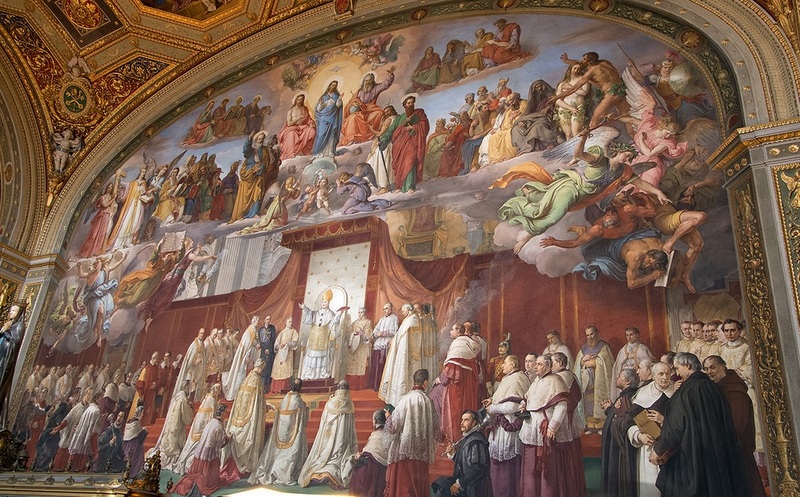 The lower part of the fresco represents the Militant Church, with Pope Pius IX as the head proclaiming the dogma of the Immaculate Conception inside St Peter’s Basilica. The upper portion represents the Triumphant Church with the Most Holy Trinity, the angels and saints honouring the Immaculate Virgin Mary. 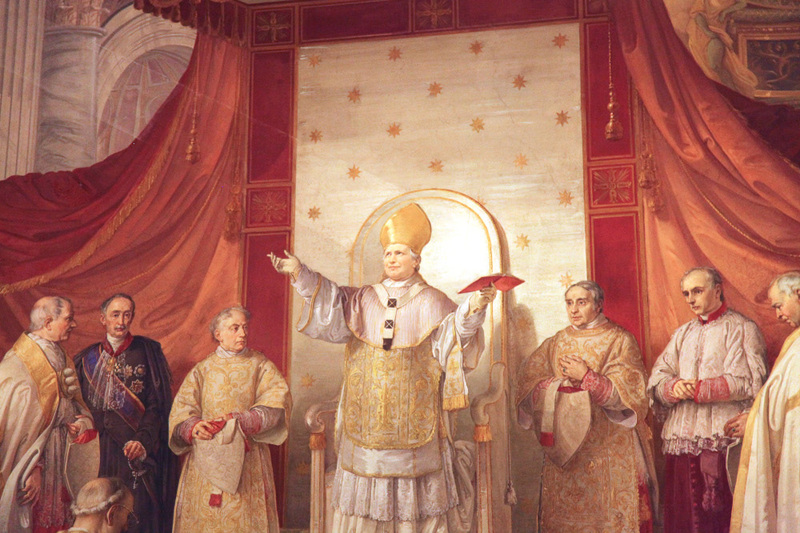 Pope Pius IX himself asked Podesti to depict him “standing up” even though the ceremony foresaw the Pope proclaiming the dogma seated upon the Cathedra, as a sign of his Papal authority to proclaim the dogma. In fact, Pope Pius IX was forced to stand up during the ceremony because, unexpectedly, a ray of sunlight shone in his in the face. The sunbeam came from the window located by the altar of Our Lady of the Pillar, in St Peter’s Basilica. The 8th December 1854 was a cloudy day and so the Holy Father interpreted this sunbeam as a heavenly confirmation of the dogma. In the fresco, the sun beam comes from the cross, supported by an angel on the top right-hand side. Directly above the Cathedra is the most Holy Trinity with the Virgin Mary in the centre. The Father and the Son are on the right and the left hand side respectively. The Holy Spirit, in the form of a dove, hovers above the scene. It is interesting to note that Mary is not on the same level as the Father and the Son but a little lower. This visual message emphasises the fact that Mary, insomuch as she is the Immaculate Mother of God, she is also still a human being. Around Mary is an illuminous halo, or aura, that emphasises her blue mantle. She is the “woman clothed with the sun, with the moon under her feet” (Apocalypse. 12, 1). According to the ancient Divine Prophecy addressed to Satan, She is the woman who will strike at his head (cfr. Gen. 3, 15). On the right-hand side of the fresco, Adam, covered in fig leaves, has his arms open wide to Mary. Eve bows her head in shame. The face of Eve and Mary are identical because, according to the teaching of the Fathers of the Church, Maria is the new Eve. In obedience to the word of God, She unties the knot of sin and death with which Eve’s disobedience bound all humanity. 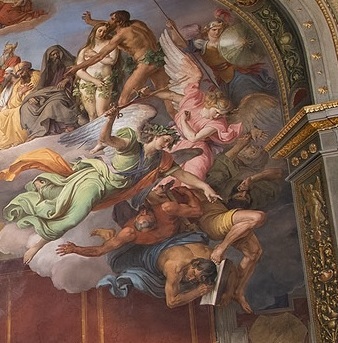 Amongst the clouds, below Adam is the battle between the angels and the devils. On the right hand side of the red baldacchino, you can just see Bernini’s Cathedra from St Peter’s Basilica. This is a symbol of the Magisterium exercised by the Holy Father that was conferred by God to confirm his brothers in faith. It is interesting to note that this is the first “infallible” proclamation from the Holy Father since the promulgation of the dogma of papal infallibility in 1870. On the opposite side four angels enter St Peter’s Basilica with great joy. The first descends spreading beautiful flowers which represent graces and blessings. The second sounds a trumpet announcing the arrival of the third angel which brings the Papal Bull Ineffabilis Deus, the Proclamation of the Dogma of the Immaculate Conception. The fourth angel is incensing the Trinity as a sign that God the Father is pleased with the prayers of the people to honour Mary with the title Immaculate. 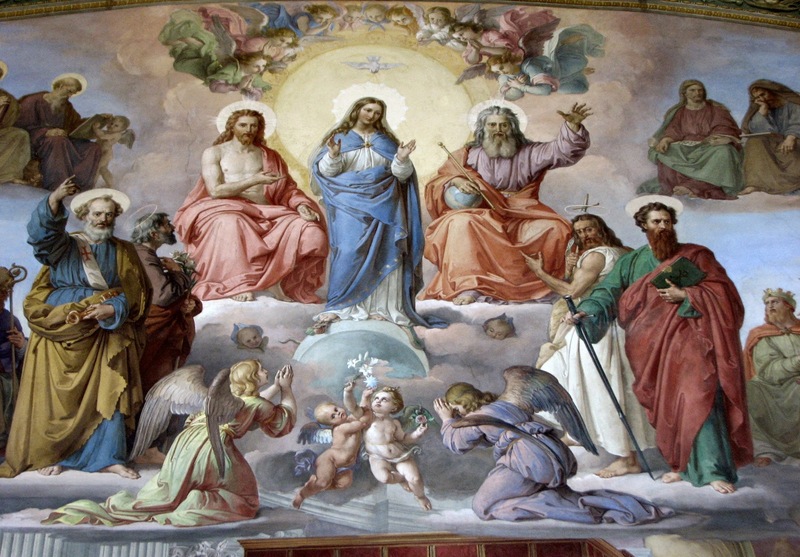 It is through the Immaculate, the aura of our redemption, that we can share in Divine sonship and so this summarises the reason that the fresco takes the tone of a great celebration.